Logan and I started our Memorial day weekend Thursday with the Rock n’ Race 5k walk/run to support the Payson Center for Cancer Care. I finished in an official 24:47.5 (#321 overall) and Logan walked with the masses. “Walk” is not like a race walk, but more like a meander through the streets. She ended with negative splits, and said next year she would enter the run just to get away from the slowpokes. I don’t blame her! Saturday, we headed to Mt. Percival and Mt. Morgan, just north of Squam Lake. It’s a 5.1 mile loop with ~1500 vertical feet. We had a nice hike up some red pine woods to Mt. Percival, and picked the cliff route instead of the potential caves. 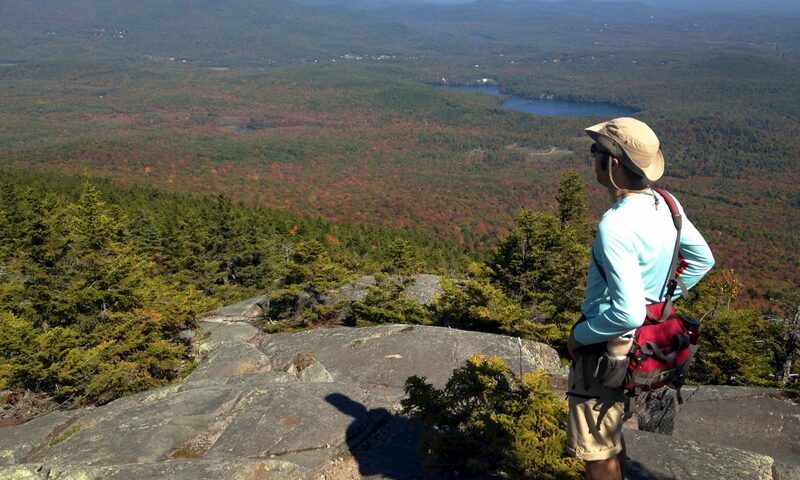 The summit had great views over Squam Lake, Lake Winnipesaukee and all the way to the Belknap range. Hiking down, stopping at signs. Sunday, we played some disc golf at the new Manchester public course, The Hollows. It’s only been open a few weeks, but it was looking real good. We didn’t keep score, but used it as an excuse to go for a walk through the woods. We are sad the weekend is over, and can’t wait for more adventures!